Before anything else, sell your Saheelis. …As in “Stop reading, open a new tab, and go to your preferred buylist”. …I’ll give you permission to wait until FNM if you prefer to stay local, but THAT’S IT. You good? Okay cool. So now that that’s out of the way, let’s talk about our gameplan for the next couple of weeks. For those of you who are newer (or are self-taught) in the realm of modern-day Magic finance, this is a somewhat volatile time. We are right now in Week 1 of a new Standard (despite no old sets actually rotating), meaning that we don’t know the shape of format in full. We have a couple weeks until the Pro Tour, which has traditionally been the first key definition for a format, despite the tendancy of PT metagames to be very clearly standalones. I’m not going to try and predict the Pro Tour this early, but I want to try and key in on everything prior. There are two kinds of new format spikes- ones predicated on speculation (Saheeli! Did you sell those yet? ), and ones informed by the format as it shapes and develops (Boros Reckoner). 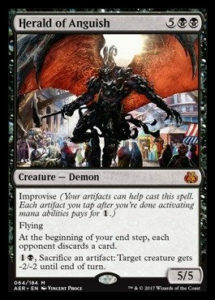 The former tend to be planeswalkers, which probably speaks more to the difficulty in evaluating the “new” card type. Finding the next Boros Reckoner is more difficult, but there has historically been a longer window of time for discovering it- Aetherworks Marvel could probably fit into this category also. Since we aren’t losing any cards, the evaluation process is a little more concrete- we know what most of the playable removal spells are, meaning we only have to compare new ones to preexisting options. Of the new class, Shock and Fatal Push are probably the only new cards that see significant play in the future- other than maybe Battle of the Bridge. With that in mind, we have a slightly easier time figuring out what threats can get past the existing removal- knowing now that there’s an upside to having a converted mana cost of 5 or more. One of the cards I like, that will serve as an example of what I’m talking about, is Herald of Anguish (the only thing that I don’t like about this card is its current $9 price tag). The toughness is higher than 3, the converted mana cost is above 4, and it has both a free incremental effect and an activated ability. While we don’t know yet how much Improvise will reduce costs, we can assume that Herald will not often cost the full 7. This feels like one of the better finishers in the format, even in a deck without a heavy artifact theme. I’m not saying that Herald is the only good card, just that it is important to go through all of the stats when evaluating a card. I will say also that this set has been underwhelming to me personally, but if you see a card you like let me know in the comments. This is not a Boros Reckoner, but it sort of is. Looking through the set as a whole, I don’t see much else that can’t be evaluated entirely in a vacuum. One of the reasons why Revolt as a mechanic is appealing in older formats is the compatibility with fetchlands, something we don’t really have access to currently. If Thopter tokens (or, for the time being, Clues) are something that have a wide proliferation, then some of the fringier options may rise in stock. Likewise, a seemingly bulk option like Aethergeode Miner could very sneakily be an engine for Revolt or energy. Clues feel like the missing piece of the puzzle in that they are artifacts that can die at will, so start to watch for Tireless Tracker to have a late career surge. My last piece of advice for this weekend is to be aggressive starting Saturday night or Sunday. If you watch the prices on Friday you’ll see them start to come down as stores flesh out their inventories and smaller shops and individuals try to undercut each other on TCGPlayer. They are doing a 3% kickback this weekend, so if you find something you like, wait until early Sunday (as in, before the Falcons beat the Packers) and pull the trigger then. It’s likely that the SCG event this weekend features mostly old decks (as well as some amount of Saheeli Combo), so I don’t expect a new card to blow up on coverage this soon. As the weekend goes along I’ll post what I’m seeing on the forums, so look for that. Til next time! PS- The reason you REALLY need to sell Saheeli is that the card has basically tripled in price before this deck has had any play time- the strategy will need to basically occupy the entire Top 16 of this weekend’s event to justify the increase. If the deck is somehow that good (and can maintain a high level of success), then a piece gets banned in a few weeks anyways. >Before anything else, sell your Saheelis.